A new Miata MX-5, called the Yusho, was revealed in Leipzig, Germany, as a concept with a fearsome 240 horses pounding away under its hood. "Yusho" in Japanese means "Victory." The meaning is not hard to grasp with this rendition of the Miata, as the tiny little cabriolet features a whopping 240 horsepower in this concept. The whole car is a beefed up Miata MX-5 from start to finish. The matte white finish says "racing simple", the 17 -inch alloys are light and airy, and the rear diffuser made of carbon fiber speaks of speed. As you eyeball the diffuser, a glance down shows not one, but two exhaust pipes and they're center mounted. That says power. The interior is all about refinement, though. An Alcantara-wrapped steering wheel faces Recaro sport seats. Under the hood is a 2.0-liter four cylinder engine tuned with Cosworth parts and a sport exhaust system. It puts out the aforementioned 240 horsepower at 275Nm of torque, putting the MX-5 Yusho's top speed at 240km/h. The Miata is due a re-design and we will be seeing a new rendition of the much beloved little car in 2014. Until then, Mazda obviously wants to promote the current version hard to keep sales from flagging. This Yusho MX-5 is a step in that direction. Wining a lot of awards for the little car in its various forms hasn't hurt either, of course. The MX-5 Yusho was unveiled at the auto show in Leipzig to mixed emotions from audiences. Like many ideas for the MIata, this one is a love or hate release. Some fans hate the idea of so much power inside their favorite cruiser while others think it would be pure joy. Non-fans just dismiss it as more idiocy from those who like the unlikeable. Whatever the view, the Miata MX-5 Yusho concept is at least outside the box for Mazda as far as this little convertible goes. As a huge fan of the car, and a former owner of a 2007, current generation Miata, I cannot understsand why more poer makes this car better. Mine had trouble putting the power down at 166 HP. I had both a limited slip Diff and also traction control. Anything Miata is fun to me, but that chassis can't handle much more than about 185 HP. You know, I've never actually driven one of these. I've ridden in one, the first of this current generation, several times (I have a friend who loves the Miata). It's built for smaller people than I, but just knowing the specs on the car tells me that this much power is either going to mean a lot of speed or (more likely) disaster. 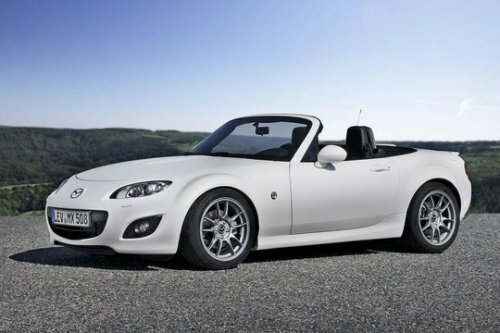 You do realise the current miata/mx5 is based on the rx8 chassis right? Plenty of fi kits added onto current gen miatas are proven to work well. 240hp FACTORY in this miata will be amazing! The chassis is only part of it, though. the RX8 is heavier, has larger wheels, and a longer frame. Strap wings on this sucker.